Seoul City Wall is part of the Tentative list of Republic of Korea in order to qualify for inclusion in the World Heritage List. I visited this tentative WHS in April/May 2017. On different days, I walked different stretches of the Seoul City Wall. Most of the city wall is reconstructed and in a way certain parts reminded me of the Xian City Wall. However, it is worth walking/hiking different parts for panoramic views of Seoul from different angles. The Seoul City Wall museum is a great place to appreciate the wall's importance. My personal highlights were visiting the 3 remaining main gates and 4 of the minor gates (photo). Seoul is preparing for inclusion of its 4th WHS in the city proper in 2017. 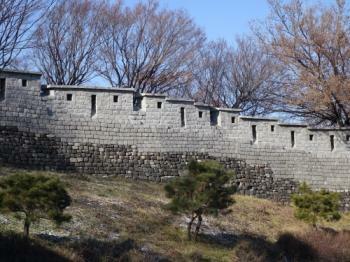 ‘Hanyangdoseong’ covers its City Wall, originally constructed in the late 14th century. ‘Hanyang’ is a reference to the old name for Seoul, while ‘Doseong’ is a “walled city where a ruler lives”. 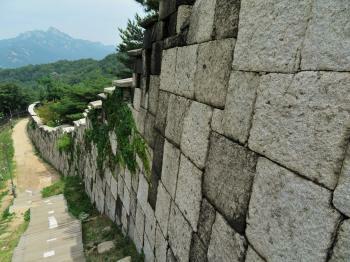 The over 18 km-long wall was built along the ridge of Seoul’s four inner mountains. The site seems well on track for receiving foreign visitors, it already has an elaborate website in English and its own Seoul City Wall Museum. 12 km of the wall has been preserved, as well have the South Gate and the East Gate. The official website has extensive information about hiking trails on and alongside stretches of the wall. I choose the shortest and most accessible route, the Naksan Mountain Trail. I started from the southern end at Dongdaemun (East Gate) – the site of one of the best remaining gates, plus the location of the City Wall Museum. Dongdaemun has its own subway stop, and from there I took exit number 1. The way to the museum and the start of the hike is signposted by arrows on the street tarmac. The museum is located in what looks like an enormous office building. It is solely used however for exhibitions on the City Wall. Entrance to its 3 floors is free. Lots of money has gone into restoring the wall over the past years, and the museum seems costly too. All has been done with future WH status in mind – I believe that there are very few countries nowadays willing to invest that much into self-promotion. The exhibits contain some interesting displays about how the wall was built (with help of lots of conscript labour from people outside the city). The Naksan Trail starts right behind the museum. The track is easy to follow. It had been snowing lightly overnight (daytime temperature was still below zero), so I had to be somewhat careful on the steep slopes. For the first part of this trail one walks on top of the wall itself. There are good views on the inner city of Seoul and also the narrow streets of the old neighbourhoods close to the wall. The nomination will also include cultural sites close to the wall, but the ones that I passed on this trail (such as the Naksan Pavillion) I didn’t find too interesting. Other stretches of the wall may have more things to see. I did enjoy my short hike though. The weather couldn’t have been better for a winter’s day – a little snow on the ground, bright blue skies and a strong sun. There were some other people (locals from the look of it) hiking as well. 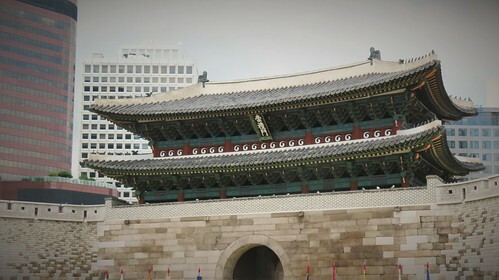 It took me about an hour to get to the smaller Hyehwamun gate, which lies within close reach of another subway station. The builders of this wall had the local topography in mind. After having walked a stretch of it, I left with a different feel for this city. Downtown it is very crowded and people live in tiny spaces, but there are magnificent mountains around Seoul. The Wall also is a testimony to the city’s long history. And with all the effort put into it (then and now), I can't see why it wouldn't become a WHS next year. I had visited Seoul City Wall previously, but two gates and two small hikes I feel was not sufficient to fully understand this nomination. Therefore, I planned 3 separate hikes along Hanyang Doseong. There are 4 courses total. One suggestion: make sure to not only hike on the wall, but alongside it. Baegak Route is perhaps the most interesting course, in part because its only been opened since 2007. This site is inexorably linked to an assassination attempt in 1968 by 31 North Korean agents who infiltrated South Korea at the DMZ. In an attempt to reach the Blue House and assassinate the President several combatants were killed in the forested area nearby. This event caused this area to be closed to the public for around 40 years. Because this portion of Seoul City Wall lies directly behind the Presidential complex, extra security is very present and you will need to present a passport before starting your 3 hour, 4.7 km hike. Also be aware there are some photo restrictions inward toward Seoul. One unfortunate reality on this route is the security checkpoints, barbwire, and even an old land to air missile defense system which makes photographing extended portions of the wall difficult. The unique elements of this hike will not be lost for most visitors, it is one more of those tragic areas that make the Korean peninsula what it is today. In closing, 26 South Koreans, 29 North Koreans, and 4 Americans were killed before the Blue House Raid Incident ended. Only one North Korean agent made it back to North Korea. This route on the Seoul City Wall is very enjoyable (and steep), but it will forever be connected to this incident. I do not imagine the extra security will disappear anytime soon. Ingwangsan Route takes about 2.5 hours, and is 4km. This route provides some of the best views of Seoul and also the most important Shamanist site in the nation. Guksadang Shrine of Inwangsan and Seonbawi Rock are not particularly stunning, but Shamanism rites and practices are present here everyday. This hike on a clear day also offers a unique perspective on Seodaemun Prison from above, which is also unique. Naksan Route is one of the easiest hikes at about 1 hour. Access to the route is also the most simple, because you can take the metro directly to Dongdaemun, History and Culture park. This will give you an idea of the tremendous gates of Hanyang Doseong before you begin the hike. Keep in mind you could begin at Ingwangsan 2.5 hours, continue on and hike the Baegak route 3 hours, and then complete 1 more hour of hiking to end at Dongdaemun (about 6-7 hours). These 3 sections of the wall are the most intact, preserved, and scenic. If you want to see another special gate, visit Sungyemun (Namdeaemun) which is easily visited using the metro. This gate sadly was heavily damaged in 2008 by an arsonist. The hiking course I did not discuss is the Namsan route, which is located by Seoul Tower. This portion of the wall is somewhat intact, but more reconstructed than other portions. I find Seoul City Wall unique enough to be inscribed. 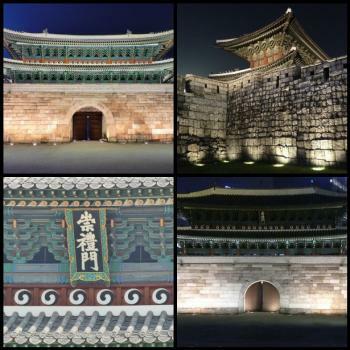 Hanyang Doseong is one of the largest and oldest intact city walls in the world. At over 18 km (though only about 12km remain today), the wall is impressive, and covers the four surrounding mountains of Seoul. Seoul City wall was built in 1396, 1422, and then restored and strengthened in 1704. Do not be mistaken when viewing the wall, some portions look more new, but often (though not always) these sections date back to the 1704 repairs. Portions of the wall recently reconstructed are usually far more obvious, such as portions of the Namsan route or one small portion by Dongdaemun Gate. I think the inscription chance is high, but I expect ICOMOS will have something to say regarding development concerns around the wall, and the restrictions on the Baegak route. One fact could make this nomination difficult, which is the high representation of Korean fortress/city wall architecture already inscribed on the list. Keep in mind on Korea's tentative list remains one additional serial fortress nomination.